We all know it’s going to happen. One day or another, someone will invent a vigilante robot or something and the next thing you know the entirety of Planet Earth is a post-apocalyptic wasteland with gunfights in the streets, rioting, and Australian kids throwing boomerangs at people. It’s a bad scene if you’re unprepared, but who wants to run around in bulky second-hand SWAT gear? Not only are you larger and easier to riddle with bullets, you also look like the Michelin Man, but grayish black. 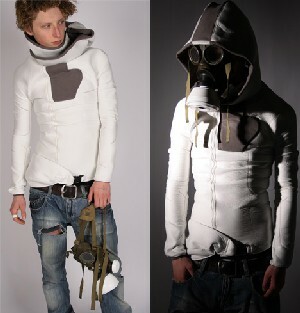 Prepare ahead of time with the light, comfortable, protective urban security suit as seen on Ectoplasmosis. That’s pretty cool, huh? Assuming it is really made of Kevlar, it’d be pretty useful for anyone in any dangerous area, not just Australia. I had a friend who, when he was out trick-or-treating as a kid, was stabbed randomly by a complete stranger. He didn’t get robbed or anything; the guy just walked up and stabbed him. Fortunately for my pal, he was able to get a hand in the way and took most of the blade in his palm, but if he had a kevlar hoodie, maybe he wouldn’t have a vicious-looking scar on his hand. It’s a perfect counterpart to the subway survival kit.